Where are the parents of these terrible children? If I did anything like this, my mother would have turned me into a stain where a kid used to be. There was no tolerance for this kind of thuggish behavior in my house. In fact, my mother would have shown me these kinds of videos as an example of what not to do. The fact that people actually do this is disgusting and disheartening. It causes me to lose faith in my generation because these are the people who are going to be in charge quite soon and these attitudes aren’t going to translate well into the real world. A 16 year-old student at the South Division High School in Milwaukee was caught on video beating his teacher following an argument. The worst part? 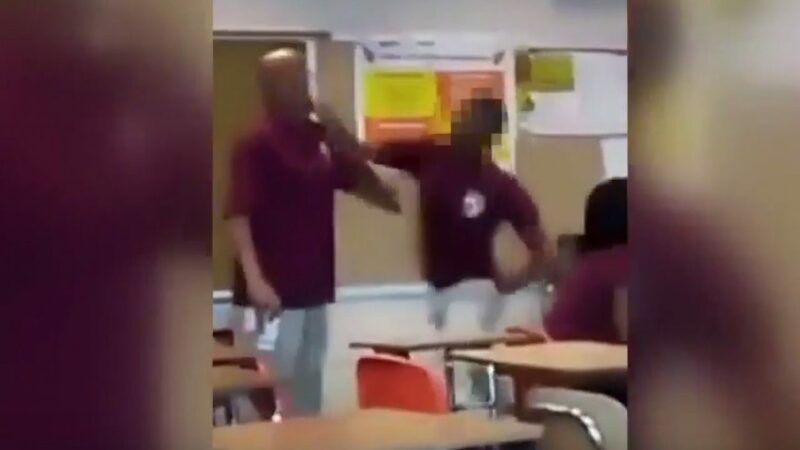 Students in the classroom either filmed the incident or cheered on the little thug as he pushed his teacher to the ground and delivered several more punches to the head. There is good news in this case. The police arrested the student at the school and the Milwaukee Alderman is calling for criminal charges in this case, to make an example of him and warn other students that this kind of behavior is absolutely unacceptable. Violence at MPS [Milwaukee Public Schools] is a great concern to the community. Actions like this need criminal charges to send a message, and hold the student responsible for their reckless and dangerous behavior. I applaud the many great teachers and students at MPS, however, there is a segment of students who choose to behave inappropriately and criminally, which robs other students and teachers of an opportunity to build a safe learning environment. Parents are concerned for the safety of their children and are outraged that a child would even consider assaulting a teacher. “That scares me. Oh my god, that really scares me,” says parent Niki Gerth, mother of a freshman daughter. So, what do you think should happen to this little punk?